This Sunday (14/2) I gave a talk/workshop about the Fedora project as an operating system and a community of contributors. In the first hour I described the Fedora as a leading community to the FOSS world and generally how many cool stuff are happening here. Later on I showed them how easy and meanfull it is to be a Fedora project contributors and I gave some examples about the Special Interest Groups. 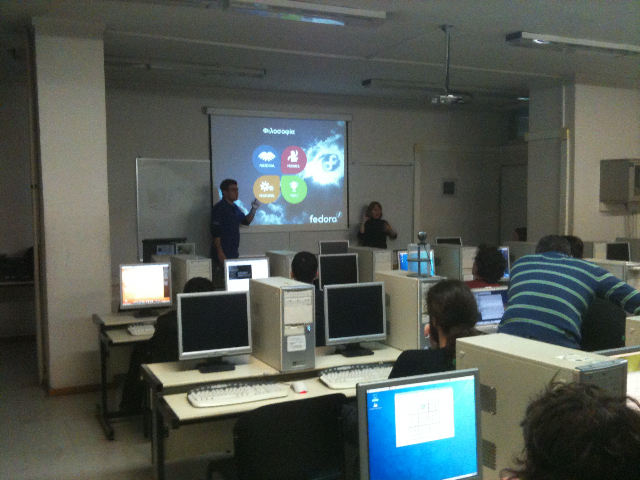 After that I presented them the new cool futures of the Fedora 12 release and how to create a Fedora 12 Live USB Stick. The last one and a half hour the talk turned into a workshop where everybody lived the Fedora 12 experience on their desktops. They had the opportunity to learn how to install Fedora 12 from a livecd to the hard drive, to explore the system and generally learn something new, simple and different from their orange funky operating system they use to work. The audience were actually 25 Ubuntu users and after the talk I received many positive comments about the Fedora Project. During the talk there were 2 GREAT (female) volunteers who were interpreting everything into Greek Sign Language. This is a new perspective which must be adopted by everyone. The whole presentation was recorded (+the girls) and it will be published soon. I really want to thank GreekLUG who invited me and in that point I want to mention that the guys are making a really good work here in Thessaloniki. In the future we are planning at least 2 more talks, one of them regarding OLPC and Sugar. You can find my presentation’s slides here. Some photos are from Fosdem and shotted by Luca Foppiano. Είναι αρκετά παλιό το λινκ αλλά με λίγα λόγια λέει ότι όλα παίζουν out of the box. Από προσωπικής εμπειρίας με το συγκεκριμένο μοντέλο μπορώ να σε διαβεβαιώσω ότι όλα παίζουν ΤΕΛΕΙΑ! Δοκίμασε το και μην διστάσεις να με ενοχλήσεις για τυχόν προβλήματα.